The Energy Zone was a themed zone for primary schools, funded by Science Foundation Ireland. Roisín is an electrical engineer making sure everyone in Ireland has enough electricity, Robert is developing biocoal – a renewable energy source helping to move society away from fossil fuels and Karen works at an airport making sure airplane fuel gets to where it’s needed. 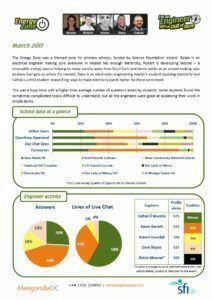 Dave is an electronics engineering master’s student studying electricity and Cathal is a PhD student researching ways to make electricity plants better for the environment. This was a busy zone with a higher than average number of questions asked by students. Some students found the sometimes complicated topics difficult to understand, but all the engineers were good at explaining their work in simple terms.